‘Content is king’ might just be the most overused phrase in digital marketing, but there’s a perfectly good reason for that. 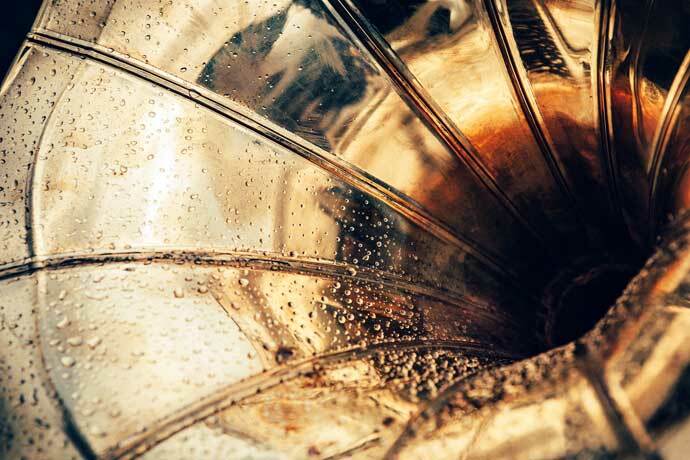 When marketers talk about content, traditionally that meant blogs. Sure, now content marketing is a little more diverse than that (think video, social media etc. ), but blogging’s always been at the heart of content strategies. Even Facebook isn’t so appealing these days. Instagram is where it’s at. That’s what a lot of restaurant managers and cafe owners will tell you if you mention the 'b' word. But blogging can still be a lucrative marketing tool for your business - if you use it right. Sure, it all depends on your audience, but for many restaurants, cafes and bars, there’s a real benefit to be gained from maintaining a high-quality blog. First, blog content has a permanence that’s the antithesis of social media content. Tweets are usually only relevant for a few hours after they’ve been posted. Blog content can keep bringing in traffic for weeks, months or even years. It’s also easier to navigate old blog content than it is to scroll through months of social media posts to find what you’re looking for. Blogs are SEO gold. In other words, Google counts high-quality blog posts as valuable content for its users, giving you a boost in Google’s rankings. That means potential visitors who are researching their options online are more likely to find your establishment before your competitors'. The networking opportunities provided by blogging are greater than those on social media. Influencers on social media are certainly, well, influential - but by teaming up with other businesses and individuals on your blog, you’ll benefit far more. Not only will you get the social media shares from the contributor and their network, you’ll also gain a longer term relationship as traffic from your site keeps heading over to theirs, helping you snag contributions from bigger names. Overall, blogging can be a winning accompaniment to your current social media efforts - particularly in the long term. That doesn’t mean blogging will work for every restaurant, cafe and bar. Depending on your market, budget and time constraints, it might not work at all. We do, however, recommend that every cafe and restaurant gives it a try! Sadly, not many great blogs start with the author writing down whatever comes into their head. With so much content on the net, you need to plan things carefully if you want to get noticed and give your audience the type of content they want. Still, planning doesn’t have to be tedious. Half an hour of brainstorming should be all you need to set your initial focus. Choose a primary goal and a couple of secondary goals, if you like. The decision you make here will shape every aspect of your blog, so choose carefully. Based on your primary objective, do some quick research into the demographics (and psychographics) of your target audience. If you want to get your customers reading your blog, ask them what kind of content they’d like. You could ask them in person at your cafe, share a feedback form or poll over social media channels, or arrange interviews (with sufficient compensation). You can also ask friends and family for their opinions. If you want to reach non-customers and expand your brand’s influence, it’s a little trickier to figure out your target market. Look at your competitors’ blogs and see who they’re targeting. You can also ask online forums, Facebook groups, or subreddits for advice. Rob is a 30-something local foodie who dines at independent restaurants in York every fortnight. He’s willing to pay a premium for food with locally sourced, seasonal ingredients. He’s visited our restaurant in the past, but not since our menu was revamped at the beginning of the year. Rob’s a busy man and doesn’t know that our menu has changed. He’d like to read about the background of our new dishes, with information on our suppliers and our ethical credentials. Rob’s active on Twitter and follows his favourite chefs, restaurants and food websites, as well as accounts relating to his other interests. He likes to research his options thoroughly before making a decision on which restaurant to book. This persona tells us not just what content is likely to appeal to Rob, but also how to reach him. It’s very important to know who you’re writing for before you even begin to plan what you want to write! Here’s the slightly technical part. You need to set up a page for a blog on your website. 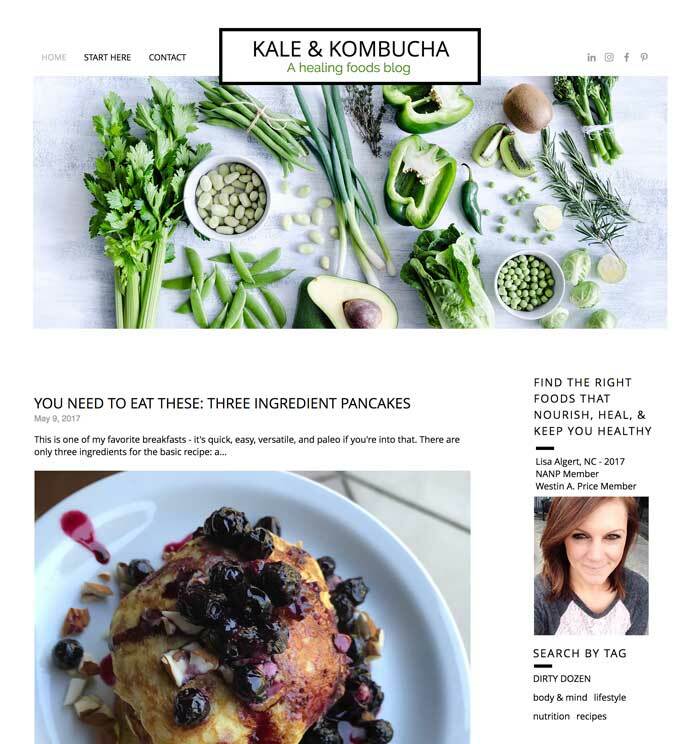 If you use a website builder like Wix (the above screenshot is an example Wix blog), WordPress or Squarespace, there are easy ways to add a blog page to your existing website. You can also use sites like Blogger or Medium to set up a custom domain for your blog. There are likely to be recurring costs associated with custom domains. Alternatively, your blog could be hosted entirely separately from your site. This option is usually free, but you’ll be left with an ugly domain name such as mycafe.wordpress.com. You’ll also need to think of a title for your blog. You can keep it simple: ‘[Restaurant Name] blog’, or give it a separate name, such as ‘Coffee Inspiration blog’ (but not as lame as that). Depending on the blog platform you choose, you might also be able to pick a theme. Different themes are suited for different content types - some might be better for image-heavy blogs, while others are more suitable for text-based content. Even if you can’t change the entire theme of your blog, you should be able to customise header images and typefaces. Think about what will appeal to your target audience. You can tinker with your blog once it’s live and populated with content, but that might mean you have to go back and make adjustments to image sizes and other parts of old blog posts. You don’t need to create thorough content guidelines dictating everything from post length, tone, image requirements and so on from day one, but you can and should make a start. These content guidelines aren’t just for you. Guest bloggers and influencers might approach you asking to be featured, so be sure you have at least some basic requirements to send across to them. 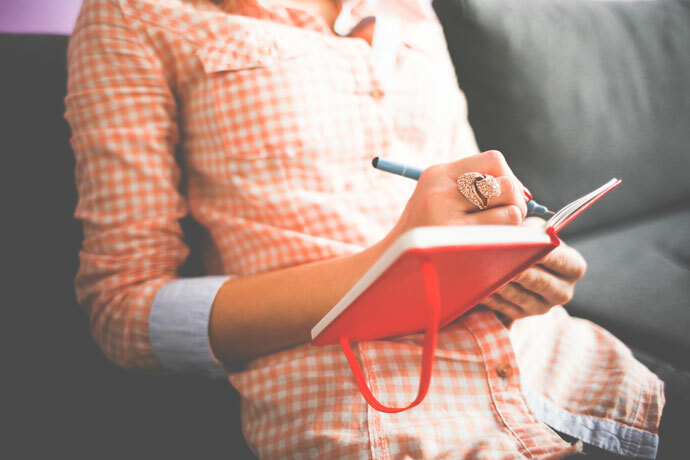 We’ll cover content ideas in more detail later on, but to start off with, you should have a few carefully-chosen topics that you can write a post on. These topics should help you meet your blog objectives, appeal to your audience, and above all, be topics that you’re experts on. At this stage, you need to decide who’s going to write and edit your first few posts. You don’t necessarily need to hire a specialist writer (either as an employee or a freelancer). In fact, the person who writes the post doesn’t even need to be confident in their writing ability. The most important decision is who’ll be your blog editor. Your blog editor needs not to only be confident in checking posts for spelling and grammar errors, they also need to understand your blog’s goals and whether or not each article contributes towards them. Blog editors must be able to maintain the ‘voice’ of individual writers while editing, while at the same time sticking to your blog guidelines. Every blogger starts with bounds of enthusiasm. There seems to be an endless pool of topics to draw from, and you can’t wait to share your thoughts with the world. Almost invariably, this enthusiasm vanishes within a month. First, your blog isn’t the instant success you’d hoped. What’s the point in investing so much energy in writing the posts if no-one reads them? Second, you’re running low on ideas. You can’t find any motivation to write the half-baked ideas you’ve scraped together. Resolving the first problem isn’t easy - but the lack of ideas is more easily solved! Competitions. Zizzi's blog is dedicated almost exclusively to sharing competition info. Menu sneak-peeks. See Byron's 'Kimcheese' preview. Most popular menu items. For example, ‘our top five winter dishes’ or ‘most popular sweet treats at our cafe’. Customer social media showcase. Embed positive Tweets and Facebook posts relating to your establishment (or a recent marketing campaign). Solve problems. ‘Japanese Dining Etiquette’, ‘Low Calorie Alternatives to Your Favourite Junk Foods’, ‘Budget-Friendly Breaks in York’. These topics only need to be indirectly related to your business. Chef’s recommendations. ‘Our Chef’s Top Picks off our Summer Menu’, ‘Our Baristas’ Favourite Brews’ etc. These articles can be written by guests, letting you tap into the expert knowledge, as Filmore & Union did for this post. Company announcements. Welcome new staff, announce new menus, boast about award victories. Local recommendations. 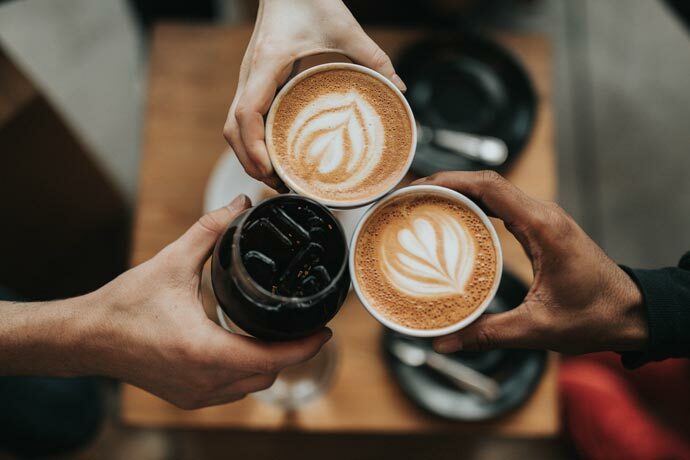 Build bridges with other businesses in your area by sharing your favourite cafes, independent shops, tourist attractions (and so on) in your town or city. Baltzersen's, a cafe in Harrogate, show you how it's done. Recipes. These can be for meals you serve at your restaurant, or other favourites. Betty's, the famous Yorkshire cafe, occasionally features recipes on their blog. Industry problems/hot topics. Talk about an issue currently impacting the wider industry, and your thoughts on it. Explain what this means for your target audience. Here's an example from Starbucks. Staff stories. Ask staff to share why they chose their current career path, and why they enjoy working for your business. Ask them to share their favourite dishes, holiday destinations, and TV shows! How-tos. Share some of your chef’s (or barista’s) secrets and explain how to cook or prepare drinks like a pro. Behind-the-scenes. Go beyond the usual photos and videos you share on social media. Talk about a recent decision your business made, and how you came to make it. This could be related to a menu choice, or how you chose your venue, and so on. Promote events. These can be at your venue, or elsewhere in the local area. Promote your social media channels. Interviews with influencers and local business owners. Tips and advice for new businesses. Become an authority on starting and running a business in your sector by explaining the lessons you’ve learnt. Phew, we got there! Hopefully one of those 20 points gave you a lightbulb moment or cured your writer’s block. The best content doesn’t rise to the top. How do I get people to notice my content? Welcome to the wonderful world of blog promotion, which, generally speaking, is where you should spend a good 25-50% of your time dedicated to blogging. After all, if nobody reads your blog, is there any point in you writing posts for it? Your promotion strategy will vary depending on your blog objectives, your target audience, and the articles themselves. We’ll look at promotion through individual channels that are available to you, but you might take a different approach depending on your goals. Your social media channels. Facebook, Twitter, and whatever other social media channels you use are obvious places to plug new posts. Use relevant hashtags, and mention any individuals or businesses you feature in the article you link to. You can also mention local publications or business groups for the chance of a further share and traffic boost. Influencers’ social media channels. You’ll increase your chance of getting a share from other businesses and influencers if you draw their attention to the article via email. Reach out to people who you think will be interested in the article, and ask them if they’d consider sharing it if they like it. On your website. Don’t forget to link to your blog on your website! You could include a preview of your latest blog article on your homepage. Employee advocacy. Encourage your staff to share blog articles on social media and with friends and family. This’ll be a challenge if your blog isn’t up to scratch, so make sure your posts are something to be proud of! Email. You may have a list of email subscribers who’ve agreed to receive marketing communications. You can either send out an email ‘newsletter’ periodically with all recent blog posts, or mention your blog (and its most recent post) within your usual promotional emails. On other websites. If you tell the online press, blogs, and influencers about your content, they might be willing to promote it on their website. Usually they’ll include a snippet of your article on their site, with their own introduction. Alternatively, they might embed an image or infographic and link back to your site with credit. It’s difficult to secure promotion this way, but it can be incredibly impactful. You’ll find that certain promotional methods are more effective than others at helping you reach your blog goals, so keep trying new approaches to see what works for you. There’s a lot to take in! 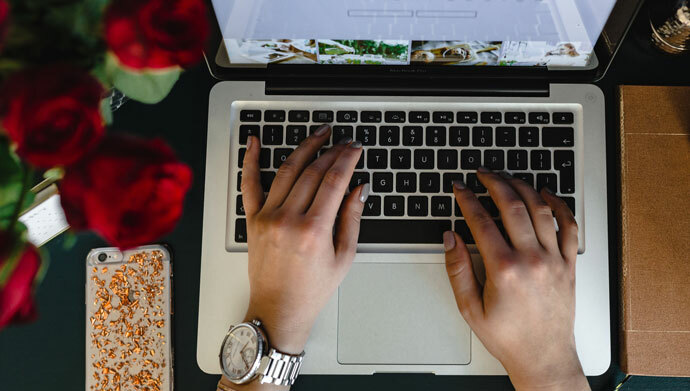 If you’re unsure about whether is blogging is right for you, or you’re looking for a little more guidance, we’ll now look at some of the most frequently asked questions relating to starting up a blog. Q: What if I’m not good with technology/don’t understand HTML? A: Don’t worry - today’s blogging platforms are extremely user-friendly and require no knowledge of HTML to use. All popular blog platforms have a visual mode, so that the code is hidden as you write articles. In fact, you can edit posts and add images as you would in your favourite word processor. A: There is no ‘rule’ here. We recommend focusing on quality rather than quantity. One post a month (or every two months) is perfectly OK if your articles are high quality. It’s also a good idea to have at least a rough schedule in mind and stick to it. If you slip from your usual schedule, your readers will be disappointed and concerned. Q: What if I can’t commit to posting regularly? A: As we said, it’s not the end of the world if you don’t stick to your blog schedule. If you know that you’ll struggle to post during busy periods, there’s no harm in preparing articles in advance and posting them later. Don’t fret too much about post frequency. Q: How long should each blog post be? A: Again, quality is more important than quantity. There’s no point focusing on creating long blog posts if no-one reads them beyond the first paragraph! Think about your blog’s audience - they may prefer articles of a certain length and structure. Q: What mistakes do new bloggers usually make? A: If anything, most new bloggers are too ambitious, particularly in terms of their publishing schedule. Another common pitfall is a failure to structure posts correctly. Sure, blogging is meant to be personal - but your articles need to have structure if they’re to be enjoyable to read. Focus on the ‘flow’ between paragraphs and sections, and present your thoughts in a logical order. Q: What makes a blog successful? A: The answer here is entirely up to you. Look back at your blogging goals and, if possible, attach metrics to them. Set targets for the number of email subscribers, blog traffic, or social media followers you gain, as applicable. Q: Can I make money by blogging? A: There are many ways to make money blogging. We don’t recommend using ads on your company blog, as it’s a huge turn-off for readers. You could look into affiliate marketing, or charge for sponsored content. For most cafe and restaurant blogs, we recommend avoiding these tactics so that your content stays trustworthy and authentic. 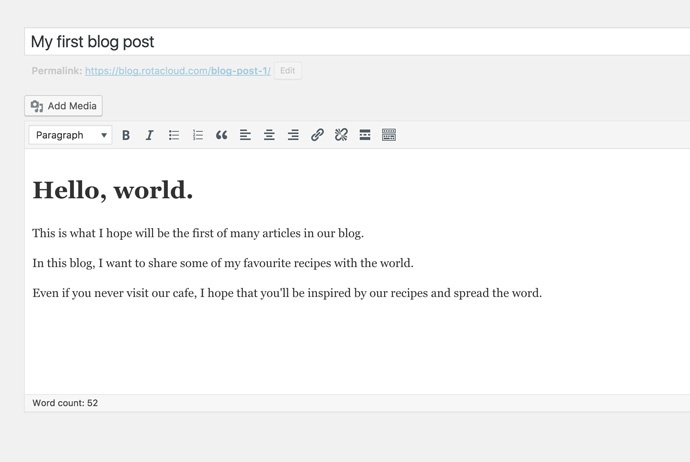 After all, the indirect gains from your blog will soon mount! Q: Should I promote the business on our blog? A: Yes, but sparingly - in most cases. Unless you want to solely use your blog as an outlet for company announcements, we recommend that the majority of your blog posts aren’t directly related to your company at all. That’s because most readers won’t care about your business - but they will care about indirectly related topics. Q: Should I write posts myself, or outsource it? A: It’s up to you. If no-one on your team feels confident in writing and editing, you could ask a freelance writer or content marketing agency to help you out. Your blog will be more authentic if you write in your own voice, however, and we recommend the DIY approach if at all possible. Q: How do I add social media posts, videos etc. to my articles? A: It’s always a good idea to break-up your posts with images and social posts. This is called ‘embedding’. You’ll find embed codes tucked away on YouTube, Twitter, Instagram, Facebook and so on - you can usually copy these codes directly into your blog post to display the video. Alternatively, in WordPress you can simply copy and paste a YouTube URL into the visual editor and the video will be automatically embedded. The same applies to Facebook and Instagram posts. Q: What’s the deal with photo rights? A: You need to make sure that you are entitled to legally publish every photo you use on your blog. Generally, images embedded in social media posts are fair game, but if you’re using photos from elsewhere, you need to check its license. Check that you have permissions to distribute, display and/or modify the image in question. You should also find out if you need to attribute the image to its source. We recommend looking for images under a 'CC0' (Creative Commons) licence so you can be certain you stay within copyright law. Q: How do I add my own images to posts? A: There are two ways of doing this. First, by uploading them to a third-party site like Imgur, then embedding them. Second, by saving them to your computer and then uploading them to your blogging platform (recommended). Q: SEO is really confusing. Where do I start? A: If in doubt, don’t worry about SEO. Remember that Google wants to reward high-quality content that users find valuable. If you can achieve that, you’re well on your way to SEO success. We also recommend you check out these SEO myths so that you’re not caught out. Q: How does local SEO work? A: Local SEO is all about boosting your rankings for keywords with local ‘intent’ - such as ‘restaurant near me’ or ‘cafe in York’. These keywords are less competitive than non-local keywords, but potentially more valuable. Here’s a complete guide to local SEO to help you get started. Blogging might not be as fashionable as Instagram and Snapchat, but it still has its place amongst the marketing mix of restaurants and cafes. In fact, your blog could form the centrepiece of your wider marketing strategy. Are there are any cafe and restaurant blogs that you follow? Let us know your favourites in the comments below!